Afgooey, an indica-dominant hybrid with a sativa/indica ratio of 30:70, can reach THC concentrations of 20%, making it a particularly potent strain for body relaxation. 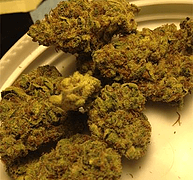 It’s a cross between Afghan #1, a classic indica, and Maui Haze, a sativa. 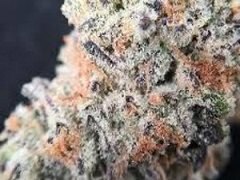 Also known as “Afgoo” or “Afgan Goo” or “Afghan Goo” or “Afghan Gooey”, Afgooey produces an upbeat creative head high, but its predominant effect is a deeply relaxing body high perfect for fighting insomnia. The flavor and smell are decided earthy, with pine and citrus notes. The high is profoundly relaxing, with a healthy dose of happiness and euphoria. It’s great for treating anxiety, PTSD, ADHD, and pain, including migraines and PMS. Anxiety and paranoia are widely reported, while dry mouth and dry eyes are less likely. Afgooey is best reserved for late at night, as its powerful effects have a tendency to induce sleepiness. 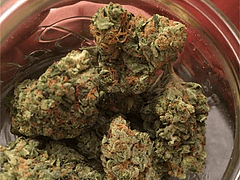 This strain is most popular in Washington and Oregon, as well as the medical market in Montana. It’s not very common elsewhere, though it can sometimes be found on the black market. The strong THC content and relaxing effects make this a prized strain wherever it can be found. © 2016 All Rights Reserved. | Designed by Insider Lalin.